The angle of elevation from a point C on the ground, at the centre of the goalpost, to the highest point A of the arc, directly above the centre of the Moses Madhiba Soccer Stadium in Cape Town, is 64.75 degrees. The soccer pitch is 100 metres long (PQ in the diagram) and 64 metres wide as prescribed by FIFA for World Cup stadiums. 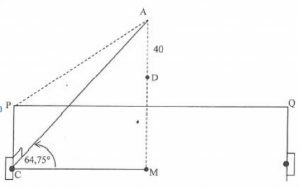 The length PC = 32 metres, M is the point at the centre of the pitch directly below A and C, and AC is perpendicular to PC. A camera is positioned at D, 40 metres directly below A. Calculate the distance from D to C.
See the Notes for Teachers.